Whitley, UK, 2 July 2014 - Crowds at Goodwood Festival of Speed got an early preview of Land Rover's new 404kW Range Rover Sport SVR last weekend. 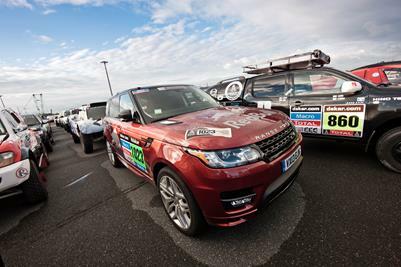 Range Rover Sport will open the legendary course to strong international entry at this Sunday's 91st running of the "Race To The Clouds"
The transformational on-road dynamics of the Range Rover Sport conquers one of the world's most unforgiving driving challenges. New hill climb record for production SUV set on 20 km Colorado Mountain's hill road. Land Rover Support Red Bull Desert Wings Dakar Team.